As technology evolves, manufacturers gain momentum in operational efficiency by leveraging innovations. A perfect example is Industry 4.0 and its smart-factory technology platforms, including the industrial Internet of Things (IoT). IoT creates connected organizations that can improve employee productivity, enable predictive disruption, address and avoid looming quality issues, and quicken prototype development. Will Healy III, strategic marketing manager, Balluff Inc.
76 percent say IoT improves insight into their customer preferences and behaviors. “Manufacturers realize that connecting the shop floor to data-management tools provides a wealth of data to help with better decision-making,” Zampa says. He cites a recent Forbes article predicting that by 2020, manufacturers will generate 50 times the digital content being generated today. Within the same article, we learn that using industrial IoT can increase overall equipment efficiency (OEE) performance by as much as 85 percent Such a move allows more competitive manufacturers to lower their labor per finished goods, “which for most represents the highest cost in their production equations,” Zampa says. Fig. 1—This OEE graph charts downtime causes for seven machines in a plant, and illustrates how chaotic a plant floor can become. All of the machines in the example have at least 37-percent unexplained downtime. Such poor performance might become evident only after initiating a real-time monitoring pilot. When thinking about IoT, consumer applications come to mind first—smart thermostats, video doorbells, Amazon Echo, etc. Manufacturers may feel pressure to start bringing IoT devices into their plants—innovate or risk falling behind. According to Plex Systems’ Foster, while the opportunity to use the latest connected devices can be exciting, manufacturers must first plan, measure and critically evaluate any technology deployment, and ensure that the new technology will improve efficiency, quality or safety. Fig. 2—Managers look at OEE at the machine level to track each production asset’s utilization rate, performance levels and quality. 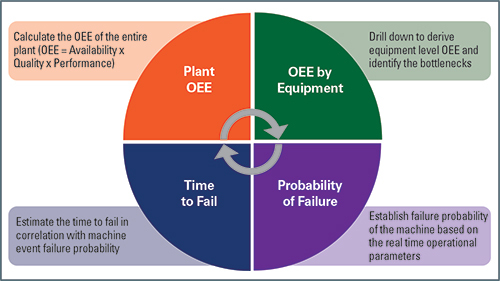 OEE also finds use for scheduling predictive maintenance of machinery. Connected devices allow manufacturers to gain incredible insights directly from the shop floor, to automate business processes and track data in ways that weren’t conceivable a few years ago. These new connected devices, Foster explains, can reveal, for example, the performance of a wire-EDM machine based on the quality of cuts. They can show a shift’s efficiency by tabulating how quickly labels are produced. And they can allow plant managers to see and repair broken machines from their living rooms. As a case study in how metalformers leverage IoT, Foster references MFC Netform, Shelby Township, MI, a manufacturer of powertrain components for automotive and agricultural applications. MFC implemented a cloud ERP system to improve quality and reduce scrap, and then started leveraging IoT to connect its people, equipment and processes to the cloud. Conference Covers All of This, and More! All of the experts interviewed here will serve as presenters at the IoT for Metalformers and Fabricators conference, April 18-19, 2018, in Nashville, TN. The conference, presented by MetalForming magazine and the Precision Metalforming Association, is designed specifically to educate floor supervisors, manufacturing engineers and managers, IT directors, and others working in metalforming and fabricating plants on the coming wave of digital manufacturing and plant-floor connectivity. In addition to the information covered in this article, attendees also will benefit from hearing case-study presentations describing IoT implementations in metalforming and fabricating plants, and the results from those projects. Learn more and register to attend at www.metalformingmagazine.com/iot/. 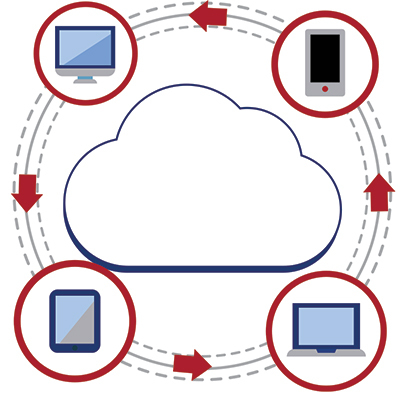 Because cloud ERP connects MFC’s entire enterprise, users can access all machine-tabulated information and any related reporting. The company can automatically correlate shop-floor machine-inspection results to product values to produce accurate scrap costs. Echoing Foster’s perspectives, IQMS’s Columbus notes that all manufacturers have the potential to improve production efficiency and quality by adopting real-time monitoring, including IoT-based sensors and systems, into their production workflows. With great volumes of data comes great responsibility. Strip away the hype, Columbus says, surrounding real-time monitoring and IoT in manufacturing and all that’s left are the core metrics and key performance indicators (KPIs) that define and predict customer satisfaction and quality. Referencing the accompanying graphic (Fig. 1), Columbus illustrates how chaotic a plant floor can become. All of the machines in the example have at least 37-percent unexplained downtime. Such poor performance might become evident only after initiating a real-time monitoring pilot. Manufacturing cycle time—Quantifies the amount of elapsed time from order taking to production. Real-time integration, applying Six Sigma to identify process bottlenecks, and re-engineering systems to be more customer-focused will improve performance. Overall equipment effectiveness (OEE)—Many manufacturers consider this the most important metric to ensuring stable, profitable production operations. OEE measures the performance of a given machine, product line, work team or entire production center. Managers look at OEE at the machine level to track each production asset’s utilization rate, performance levels and quality. 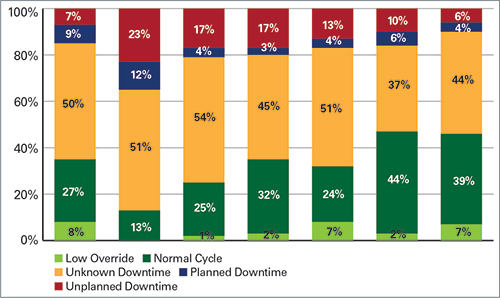 OEE also finds use for scheduling predictive maintenance of machinery (Fig. 2). The formula to calculate OEE: Availability x Performance x Quality. Production yield rates by product, process and plant location—Yield rates reflect how efficiently a machine or process transforms raw materials into finished products. Yield rates also reflect the stability of OEE rates and the effectiveness of overall production workflow. Greater real-time integration, improved quality-management systems, and greater supply-chain quality and compliance all positively affect yield rates. Perfect order performance—This metric indicates a manufacturer’s ability to deliver complete, accurate and damage-free orders to customers, on time. The equation used to define perfect order performance (perfect order index, POI): Multiply percent of orders delivered on time by percent of orders complete by percent of orders damage-free by percent of orders with accurate documentation by 100. Return material authorization (RMA) rate and percent of manufacturing—This represents the percentage of products shipped to customers returned due to defective parts or otherwise not meeting requirements. RMA serves as a good leading indicator of potential quality problems. How Do We Move From Here to There? “Over the last two years,” notes Phillips, of Connected Factory Global, “I have spoken with many manufacturers about Industry 4.0—machine shops, metal fabricators, injection molders and assemblers, and companies small to large. Three common questions I hear: What is IoT? Why should I care? Where should I start? Industry 4.0, explains Phillips, collectively includes four system-design principles. Interoperability: The ability of machines, devices, sensors and people to connect and communicate with each other via IoT. Information transparency: The ability of information systems to create a virtual copy of the physical world by enriching digital plant models with sensor data. Technical assistance: The ability of computer systems to support humans by aggregating and visualizing information, thus enabling companies to make informed decisions and solve urgent problems on short notice. Decentralized decisions: The ability of cyber-physical systems to make decisions on their own and to perform their tasks as autonomously as possible. To start down this road, Phillips supports the ideology preached by Columbus: Take the time to develop a roadmap, rather than jumping in and implementing piecemeal solutions. 1) Assess the current-state organizational capabilities of your people, processes and technology. 2) Prioritize improvement opportunities according to KPIs such as OEE, lead-time reduction and on-time delivery. 3) Analyze information value loops. 4) Identify information value drivers. 6) Create an implementation roadmap. 7) Develop a risk-mitigation plan. “Consider what may not go according to plan and assign a likelihood and consequence level to each risk,” Phillips says. “Then create mitigation plans for each risk that carries potentially severe consequences. As a final tip, Phillips recommends that companies use the Smart Industry Readiness Index, a tool available online from the Singapore Economic Development Board. Connected Factory Global has converted the assessment tool into an online survey. Respondents receive free feedback on how they compare to others, and guidance on how to create their own roadmaps. Finally, we look at the plant-floor technology that collects the data that the ERP/MES systems need to enable the benefits described above. “Getting data off of the machines is not a new concept, and the meaning of connectivity has changed significantly through the years,” says Wintriss’s Finnerty. “Beginning in the 1980s, customer demand pushed industrial-controls manufacturers to provide some means to automatically collect production data. Data flowed over RS-232 serial communications to a dedicated DOS computer, which stored production-count data on floppy disks for later analysis. The ability to notify specific troubleshooters to the existence of production issues quickly and automatically. Connecting a press shop can seem like a task only for larger manufacturers. And, many metalformers already have reliable, yet aging, equipment on the shop floor that is not yet ready for the scrap heap. So, how then does a metalformer remain competitive and at the same time bring IoT to their existing facility and equipment? However, Healy warns that it doesn’t always make sense to have an Ethernet infrastructure for small amounts of data. In home-automation systems, for example, a smart light bulb or smart switch has only a few data points to communicate. These IoT devices typically use an open standard to connect many smart devices to one Ethernet address. Illustrating use of IoT in metalforming operations, Healy points to Eagle Press & Equipment Co.’s implementation of IO-Link as a simple platform to allow smart sensors to communicate with an automation controller. Not only does the smart sensor report its measurement or switching data, but it also can communicate diagnostics and parameters. Eagle Press has seamlessly integrated pressure, level and temperature smart sensors in a variety of applications on the press, including the lube, clutch and bolster control to monitor hydraulic fluid level, pressure and temperature. Additional smart sensors can provide control of the scrap-chute door, counterbalance and hydraulic-overload circuit. Likewise, an IO-Link linear position sensor can measure shut height. In the end, all of these IO-Link devices across the machine enable it for IoT applications. Healy’s final thoughts concern adding IoT capabilities to existing equipment.